Mail Boxes Etc. UK & Ireland has earned top accolade in the global MBE Master Licensee Excellence Award 2015, which is judged amongst 32 countries worldwide. Pictured above: MBE UK & Ireland chairman, Simon Cowie (l) receives the MBE Master Licensee Excellence Award from Giuseppe Bergonzi, general manager worldwide development, MBE Worldwide SpA, Milan. Chairman Simon Cowie and his team received the award from MBE Worldwide SpA, recognising their efforts in developing the UK network of over 150 high street stores that provide a range of essential services to businesses and consumers, including post and parcel delivery, virtual office and mailbox rental as well as fast-turnaround printing. 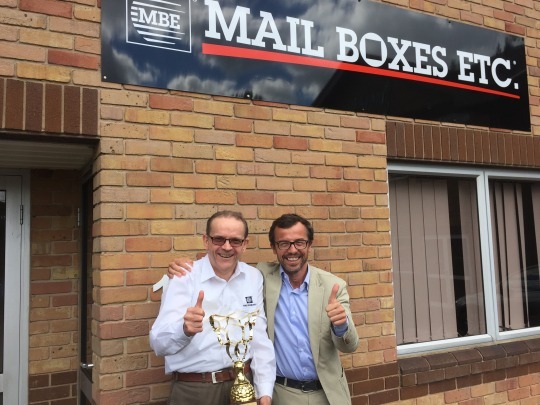 MBE UK’s new and improved services include Auction Logistics from Mail Boxes Etc. – a dedicated logistics service for auction houses and their buyers; OneDrop – a click and collect service for busy people who are not always around when their online shopping is delivered, and Deliverease – a straightforward, competitively priced parcel delivery service for people who prefer a friendly, face-to-face service.